Our Meyer lemon tree is loaded with fruit these days, so I have been working on incorporating lemons into as many familiar and new recipes as possible. When I saw Ina Garten’s recipe for a “Mocha Chocolate Icebox Cake” in her how easy is that? cookbook, I immediately thought about adapting it to spotlight Meyer lemons as a Meyer lemon icebox cake. Not much of a baker, I was relieved to discover that this cake is all about assembly rather than precise measurements and oven temperatures. I decided to add some limoncello, lots of lemon zest and incorporated a small amount of lemon juice into the filling. Trader Joe’s sells small, crisp “Meyer lemon cookie thins” that worked perfectly for the cookie base. I found it simpler to assemble the cake using four rather than the five layers of cookies and filling recommended by Ina. It seemed like too many cookies when I measured out the recommended 24 ounces, so I have decreased the amount for this recipe. TIP: No need to buy a large, expensive bottle of limoncello. Trader Joe’s sells a small, inexpensive brand that works perfectly well with this recipe. 1. Using a standing mixer with a whisk attachment, combine the cream, mascarpone, sugar, limoncello, zest, lemon juice and vanilla. Mix on low speed to begin, gradually increasing speed until stiff peaks form. 2. Use an 8-inch springform pan to assemble the cake. You will be making 4 layers of cookies and 4 layers of filling. Begin with a layer of cookies, overlapping them so as to create a solid base. 3. Next, add 1/4 of the filling. Repeat cookie-filling layers 3 more times, finishing with cream on top of the cake. Smooth with an offset spatula. Cover and refrigerate overnight until firm. 4. To serve, run a knife around the outside of the cake and remove the sides of the springform pan. Using two spatulas, lift the cake from the bottom of the springform pan. Place on cake stand or plate and garnish with lemon zest curls. Cut and serve immediately. I’ve never seen a cake like this, Liz. 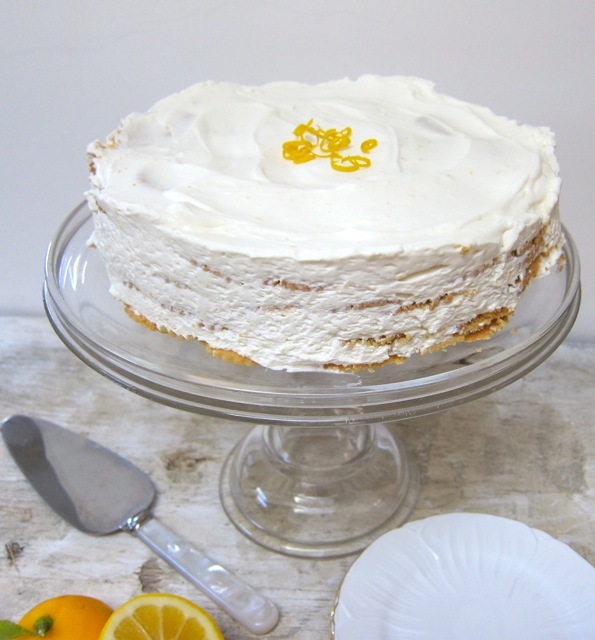 It sounds great – and I love your photo – a gorgeous use of your Meyer lemons. And this is the perfect cake to make ahead for a party!! Larry ate 2 pieces after I got the shot I wanted -thanks!Yes, a non-baked cake! I am envious of your lemon tree! This looks great- a real taste of summer! I love the sound of creamy filling verses crunchy biscuit. Hi Jayne – I think I will add even more lemon juice next time. This is great. It’s also dangerous. I love the lemons at this time of year! no big crowd needed just walk across the street. i want to see how you cut it without all the cookies falling apart. Thanks, Toni, it cuts as if a pie – honest. Larry ate 2 slices this afternoon – and I was able to lift it off the bottom of the springform pan for my shot! Want leftovers tomorrow? What a terrific icebox cake! I think I see this weekend’s dessert… I’m envious of your Meyer lemon tree. I just bought some Meyer lemons and ended up eating one plain – love their flavor! My advice is to add more lemon juice and zest – I was disappointed that it didn’t taste as lemon-y as I had hoped. But it was totally good. You have a Meyer Lemon tree? I am so jealous! Can’t think of a better way to use all that beautiful fruit than this lovely cake. Gorgeous cake, my friend!! Thank you SO much for having us over today. I truly enjoyed the afternoon, and yes, the drive home was far easier with the clear roads. I’ve gained so much information from all of these blog meetings, and the food? Fabulous!!! My daughter’s name is Liv, and she truly “Liv’s Life”! She’s still dancing today, it’s a long one for her. Thanks again, and I look forward to meeting you again soon! What a beautiful way to celebrate Buddy Girl and her special life. Mine reminds me of my dear grandmother who bought it for me many years ago. You are way ahead of me; I have TWO Meyer lemon trees that are bursting at the seams and I haven’t gotten my act to do anything more than ricotta cheese with them. I will be making the cake for the office peeps… after we take a slice or two out for home use. This is fantastic!! I love the layers and layers of lemon. Thanks, Brandon – but I have to give credit to Ina Garten for the original recipe. I actually prefer lemon to chocolate, in general.